About a year and a half ago in autumn 2013, I was working as the lead developer with Vitalik Buterin (who later became the initiator of the Ethereum project) on another project with the name ‘Keidom’ (now called ascribe.io). The idea behind Keidom/Ascribe was to develop a custom colored-coin web-wallet for registering and transfering digital art in a secure way, based on the Bitcoin blockchain, with build-in proof-of-existence. We developed a working prototype during September and November 2013. I met Vitalik for the first time in Berlin for the Berlin Bitcoin Summer Meetup and traveled with him and Mihai Alisie to Barcelona, to the (in)famous Calafou camp with an anarchistic touch. I met Vitalik again in Milan together with Amir Taki and then later in Vienna, together with the Mycelium guys. 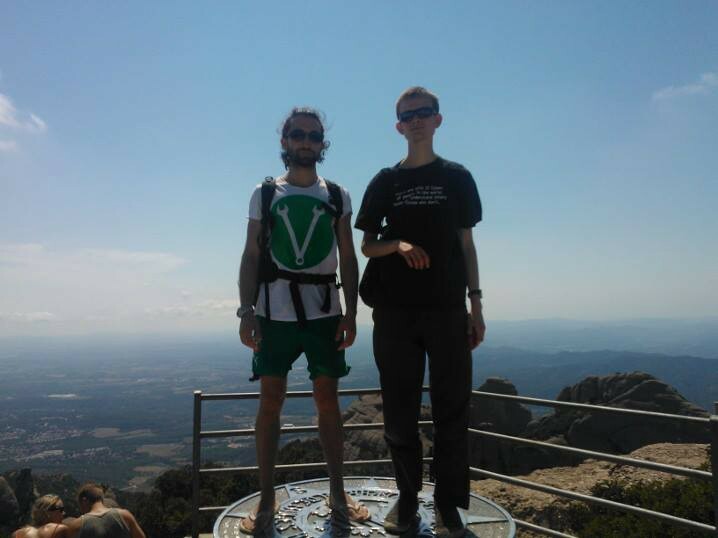 Vitalik and me standing on the top of Montserrat near Calafou, near Barcelona. During our Vienna meeting we set the goal to work together on the Keidom/Ascribe colored-coin wallet. From the beginning on, we were working in a distributed fashion. Vitalik left for Zurich and I went back to Berlin. About two weeks later there was the Amsterdam Bitcoin conference where we met again. Then Vitalik left Europe afterwards for Israel to start working on the side for the Mastercoin project and I went back to Berlin for a short time before leaving for Bulgaria for all of November. Vitalik, who is considered ‘the father of Turing-complete financial scripts’ by the founder of Mastercoin ‘JR’, and me stayed in touch almost every day because of our colored coins wallet, so that one evening in the mid of November I asked Vitalik more about what Mastercoin actually is. I never really spend time to understand it because of the poor quality of the whitepaper, the unfortunate name “Mastercoin” (got recently rebranded to Omni), and the not-quite-right name ‘The Second Bitcoin Whitepaper’, as if Satoshi Nakamoto wrote it himself. Out of this conversation late at night Ethereum might have been born, as far as I can tell. To verify this I attach the chat log so that everyone can judge himself. Back then we wanted to build something like Ethereum on top of Primecoin because it seemed like the most advanced and innovative crypto-currency at this time. Especially the innovation in the Proof-of-Work was significant. For the first time the work had more meaning than just securing the network and distributing coins. In summer 2013, I had verbalized the “Holy Grail of Decentralized Computing”, inspired by Primecoin’s Proof-of-Work. I.e., to find computational problems which are hard-to-solve and which have at the same time meaningful solutions which are easy-to-prove, so that one can create a a blockchain-based crypto-currency and reward coins for solving the problems. I never really developed the idea though. I observed the development of Vitalik’s Ethereum project for a while, took part at the first Meetup in Miami at the North American Bitcoin Conference in January 2014 but ultimately decided not to get more deeply involved because of personal reasons. Later on I spend quite some time with Ethereums CTO, Gavin Wood, in San Francisco and Berlin, where we developed an idea to solve the scalability issues of blockchain technology. I never had a job at Ethereum or received any form of compensation. Just some stories to share, and this is what I do here. First Ethereum Meetup in Miami in January 2014 — I am the second from left in the back row. [17.11.13 00:10:39] Yanislav: where did you read this? [17.11.13 00:14:54] vbuterins: for the glory of Sunny King? [17.11.13 00:16:07] Yanislav: is there really no alt coin with a real blockexplorer? [17.11.13 00:24:06] Yanislav: are there any good ‘msc 2.0’ proposals? [17.11.13 00:24:12] Yanislav: why maybe? [17.11.13 00:24:47] vbuterins: > [6:24:00 PM] Yanislav: why maybe? [17.11.13 00:30:03] Yanislav: how much btc (in master coins) did the people get who gave a btc to the exodos address? [17.11.13 00:32:34] Yanislav: how does the verification of the msc transactions happen? [17.11.13 00:35:52] Yanislav: > you can send 100000 msc in 6000 satoshis how do you ‘own’ master coins if it is not like colored coins? [17.11.13 00:47:12] Yanislav: what if there are two claims? [17.11.13 00:49:03] Yanislav: what if there are two competing algorithms? one which accepts a claim and another which rejects it for whatever reason? [17.11.13 00:52:04] Yanislav: but there is no concept of ‘the longest chain’ in msc…? [17.11.13 01:02:46] Yanislav: i wonder… is bit coin already scalable enough to cope with all those new transactions? [17.11.13 01:05:01] Yanislav: if msc could encode itself in the bit coin block chain… that would be cool!! [17.11.13 01:05:43] Yanislav: can we do this with the xpm block chain please? [17.11.13 01:11:34] vbuterins: what do you mean? [17.11.13 01:12:57] Yanislav: how can we embed an algorithm into the block chain? [17.11.13 01:23:39] vbuterins: what if there’s a massive discovery in crypto? [17.11.13 01:27:38] Yanislav: any suggestions? The chat log got published with consent of Vitalik. Thank you, Vitalik! And have a good launch!